Ask Away Blog: Restaurant.com - Best Deal. Every Meal. When it comes to dinners and gift ideas I'm a huge fan of Restaurant.com, the trusted and valued source connecting diners, restaurants, businesses and communities since 1999. They offer savings at thousands of different restaurants all across the nation and have nearly 50,000 gift certificate options. The Restaurant.com Independent Consultant program offers thousands of self-employment opportunities to individuals that want to earn money while helping Restaurant.com to expand to more restaurants, businesses and communities nationwide. To date, Restaurant.com customers have saved more than $1 billion through the gift certificate program filling more than 3.5 million tables annually. Restaurant.com is a pioneer in the restaurant deal space and is headquartered in Arlington Heights, IL. So what does all of this have to do with Mother's Day? 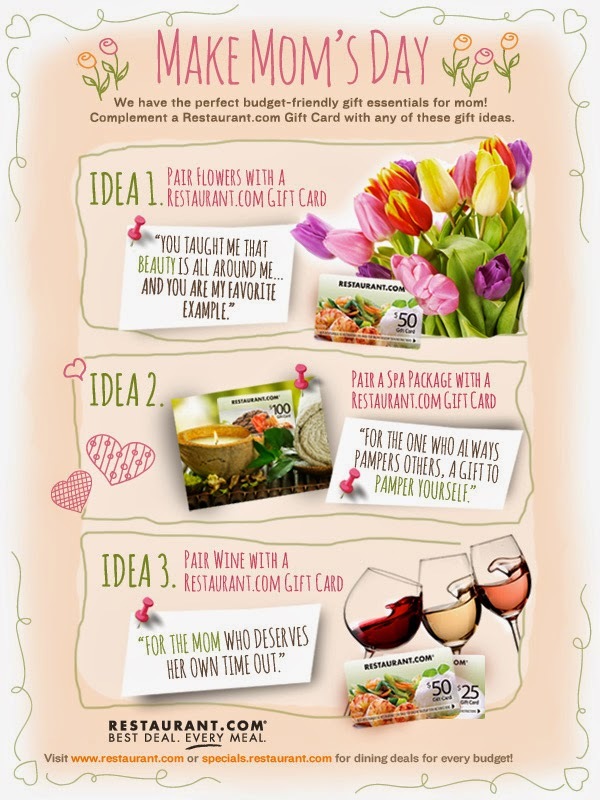 Well, not only can you pair a Restaurant.com Gift Card with the ideas below but you can also enter into the "What Does Mom Mean To You" Pinterest Sweepstakes! 1. The Blooming Role Model: "Mom always taught us that beauty is all around us, and she is our favorite example." Share the beauty of a bouquet of flowers by surprising her at the front door with an invitation to lunch or dinner. She can enjoy her flowers before heading off to a nice meal with her Restaurant.com Gift Card. 2. The Spa Lover: "For the one who always pampers others, now is the time for mom to pamper herself!" Help her enjoy the serenity of a spa treatment complements of you by finishing it off with lunch at a new restaurant using a Restaurant.com Gift Card. 3. The Wine Enthusiast: "For the mom who deserves her own time out!" What better to pair a delicious bottle of wine with than a Restaurant.com Gift Card for a Mom's Night Out! Such great ideas, which will you choose!? And don't forget about the sweepstakes..In celebration of Mother's Day, Restaurant.com is holding the "What Does Mom Mean To You?" Pinterest Sweepstakes from Monday, April 28- Sunday, May 11. There are five winners that will be randomly selected to win a $500 Mom's Night Out Package!